A couple weeks ago Josh and I got together to plan for our games at Adepticon (brief post about that coming soon). I'm pleased to remind you all that we will have not 1, but 2 Mech Attack games on Saturday the 30th. As I write this, both of these games still have spots available so please come out for a truly dramatic gaming experience! 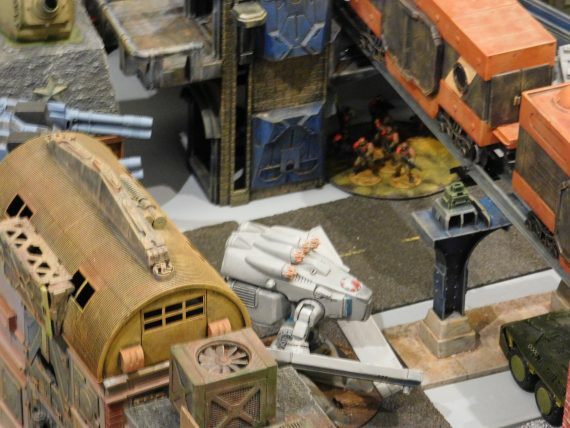 In 2367 the galaxy is at war, but the popularity of Mech Arena Combat is undiminished. For nearly 60 years the Maersk Tesla corporation has hosted some of the highest-profile tournaments on their headquarters planet of Nu-Jylland. During the Terran summer months, governments, corporations, mercenary factions and even independent teams send representatives to Nu-Jylland to compete for massive prizes and interstellar fame. Join a team, Choose your mech and join in the free-for-all chaos of a Nu-Jylland newcomer bout! 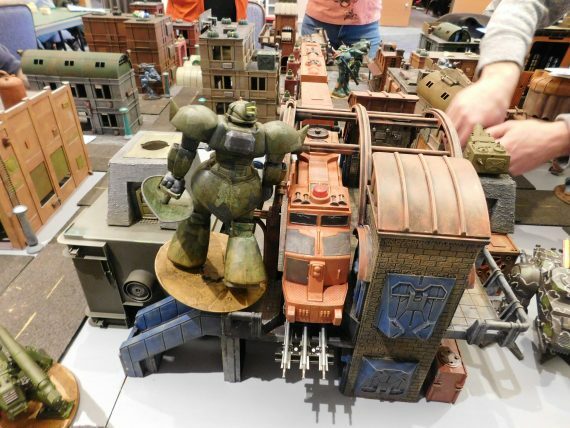 No experience necessary and everything will be provided, but if you have a 28mm'ish Mecha Model (painted and between 5 and 9 inches tall) that you'd like to use, bring it and we'll try and include it in the game. Walk-ups are welcome throughout the game. -Then, at 1 PM the scenario game Mech Attack: The Hunt continues the ongoing narrative of 5 years of convention games. Dramatic Mech Combat in Glorious 28mm! It is late 2367 and the attempted occupation of Melk-3 nears it's bloody end. Retreating occupiers the United Colonies (UC) have been denied extraction via Nue-Valstetch Spaceport by the Melk Defense Forces (MDF). Fleeing deeper into the city of Nue-Valstech the UC remnants attempt to keep their memory cores and VIP's out of the hands of the MDF who are bent on retaking the planet and bringing the UC leadership to justice for their numerous crimes. Take command of UC or MDF forces in this deadly game of cat and mouse. 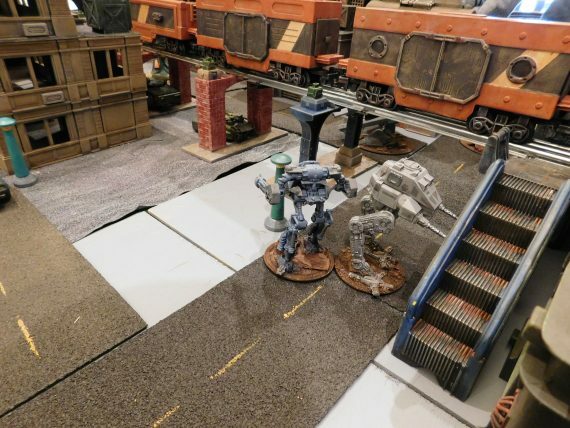 This is the 5th year that Chicago Skirmish Wargames has run a Large-Scale Mech Attack game at Adepticon, each advancing the storyline and more spectacular than the last. It is nice to see you posting again. Did you and Josh need help running the games? I may be free to be at the Con on Saturday. Hey Michael- I could use help with my walking dead game on saturday morning! I will check with my schedule to see if I can make it. If I do I will let you know. What time would you need me there and how long will you be staying? Also what is the cost to get into the Con? Thanks. The con is FREE to attend, shop the vendor hall, and observe. 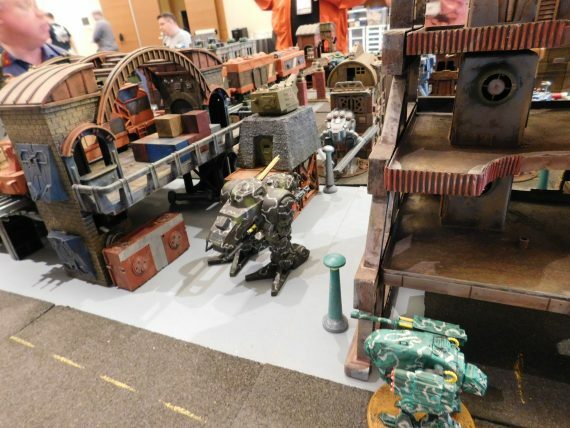 It’s well worth the trip to hang out with so many other fans of the hobby and see their craft. I highly encourage attending!